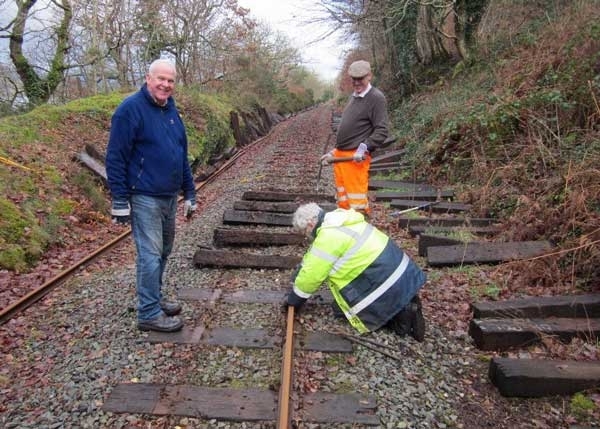 January has been a decidedly busy month (witness one of our biggest news pages to date) with much activity on the boiler front plus fevered progress on track relaying and maintenance. 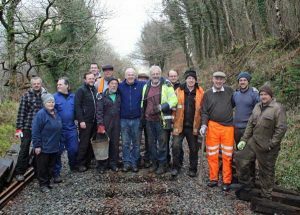 The Wednesday Gang and the Working Weekend/Week, which started on the 19th, produced a remarkable amount of work carried out by our intrepid band of volunteers, this time featuring three Railway Directors who like nothing more than getting deliciously filthy for the best possible reasons. 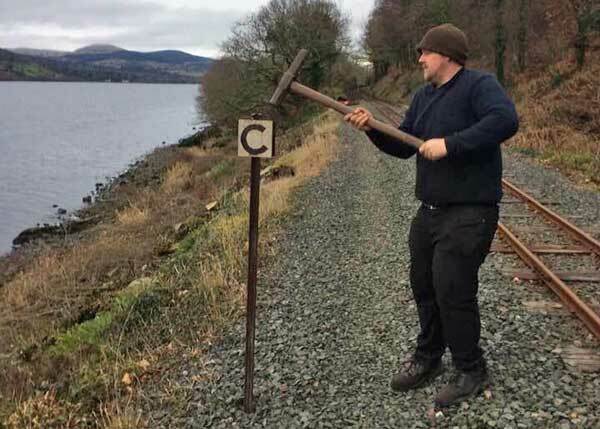 Bob Greenhalgh takes up the story for one day, but we include this time numerous photos as they are varied and can say so much as well, including Dan Laidlaw working the ‘ballast plough’ of his own and Rob Houghton’s invention (or ‘ballast skiing’ as some humourist termed it). Despite suggestions of snow, the weather for the first day of the working weekend was surprisingly decent. An excellent turnout left Llanuwchllyn to be joined at the ‘sea-wall’ by Thomas, Norman and Barbara as well as Rob and his tractor. The Wednesday Gang had already made a good start which helped greatly. Tools were unloaded and work started in small groups. 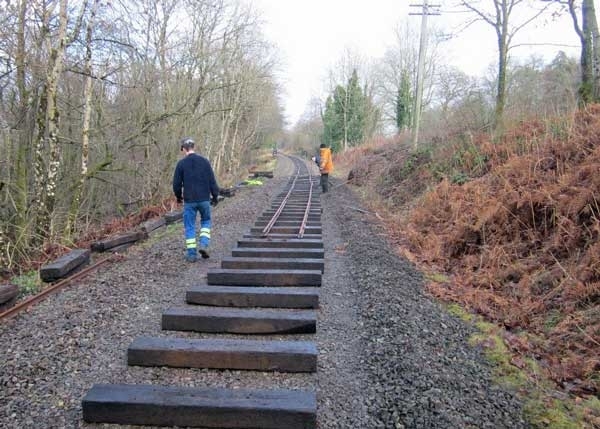 Rails were un-spiked and lifted to one side, ballast dug from the sleeper ends, sleepers then lifted and moved to one side. 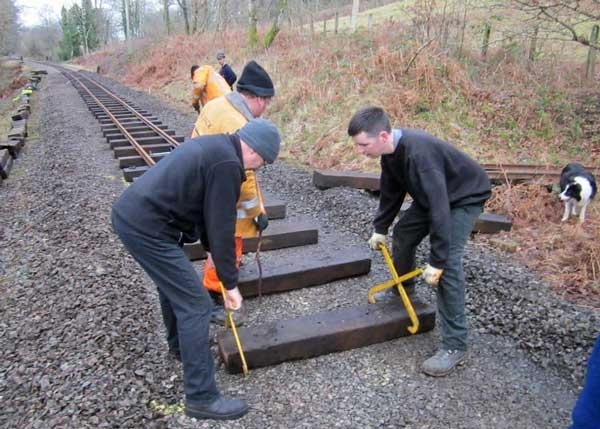 Fishplates were methodically attached to the rail ends so as not to lose them and the spikes were collected and assessed for future use. 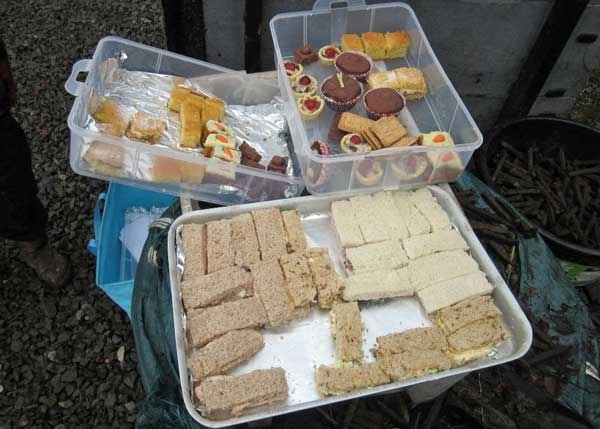 All this work, needless to say, brought on a thirst so tea was taken, along with biscuits and, of course, flapjacks! The whole section of track (over a quarter mile) was lifted in around three hours, a magnificent effort, and in celebration, a team photo was taken. The next step was to plough the ballast several times and when that had been done, it was rolled repeatedly. 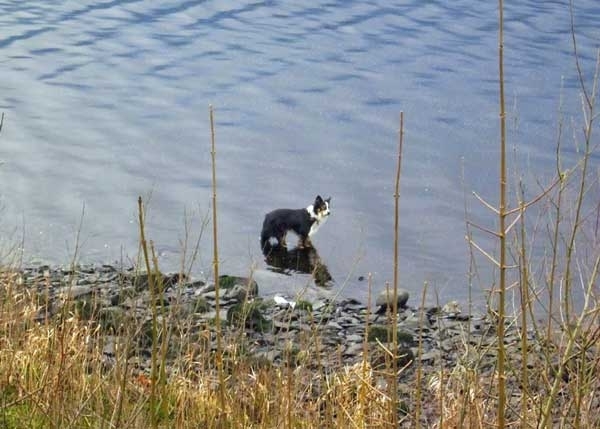 Those of us not now on the track started to ‘bushwhack’ the growth by the ‘sea wall’. 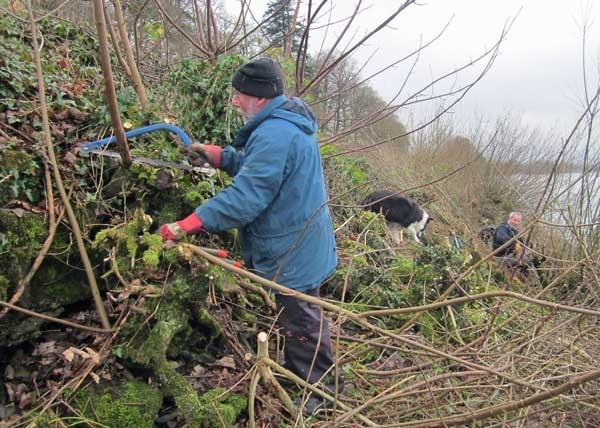 By the end of the day, we had cut down about 200 yards of view-impairing growth, a magnificent effort by all concerned and what a difference it made although the photos struggle to do it all justice. Tired but happy, we went back to Llanuwchllyn, unloaded the ‘catoflat’ works bogie wagon and had (more) tea. All in all, it was a truly great day’s work by a great team of people. I was proud to be one of them. 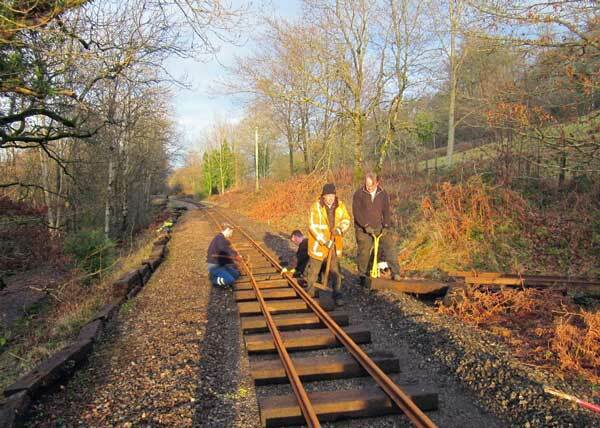 Day 2 saw track being relayed, a process that starts with spacing the sleepers roughly in place, then adding the rails. 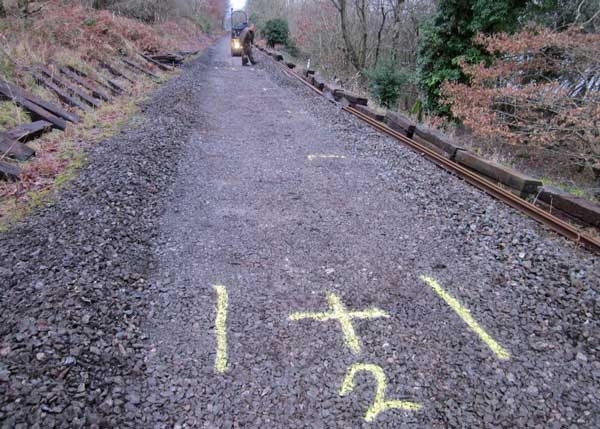 These are then aligned with positions marked out before anything was removed, and any particularly high or low spots in the ballast bed ‘adjusted’, usually forcibly, before moving on to the next length. 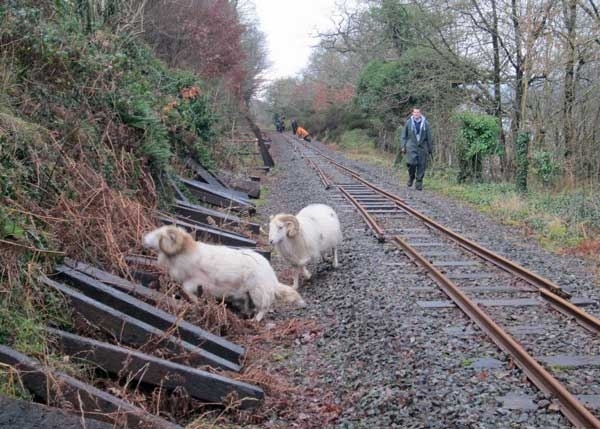 Another team follows up to spike the rails to the sleepers. By the end of the day, 12 lengths had been laid, followed on Day 3 with 13 and Day 4 with 14 as the gangs got more proficient. 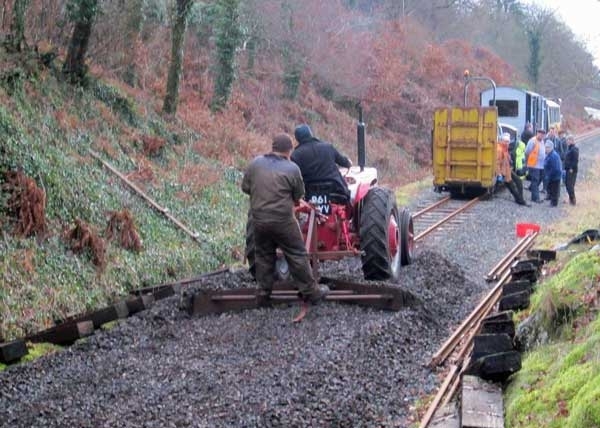 By the end of day 4, the whole was reconnected to the rails at either end, leaving the ballast to be ploughed back, this time using an attachment to our trusty diesel, Bob Davies, after which the whole was finally levelled and aligned. The video below provides a fantastic visual record of the Working Week and all that was achieved. 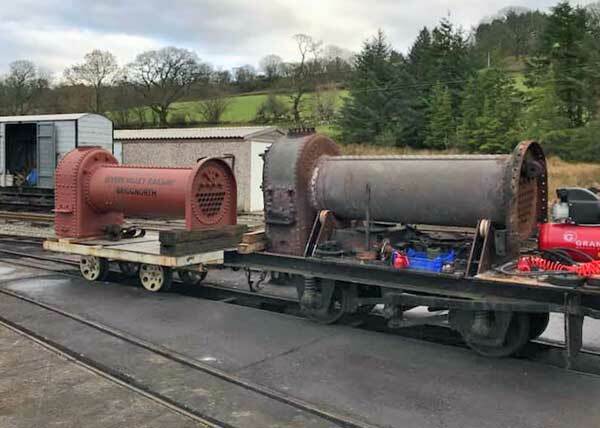 Boilers are always in the news over the winter period and, as promised, we report more details on the new one built for Alice. 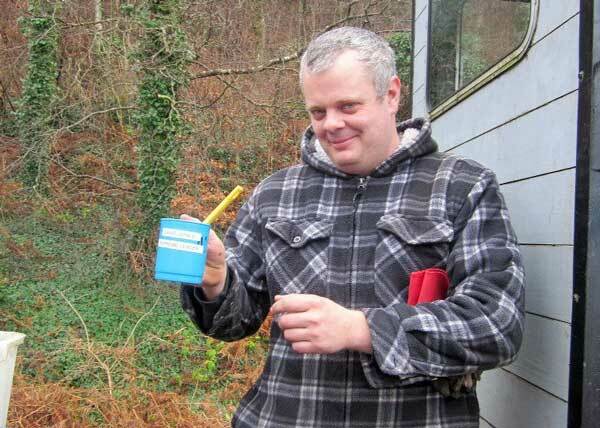 As we mentioned briefly last month, the new boiler for Alice was collected just before Christmas. Constructed by the Severn Valley Railway, it has been built to an original design which will safeguard Alice’s future for many years to come and which will also keep her appearance as authentic as when she was working in Dinorwic Quarry. The current boiler has performed really well over many years and crews have paid it a great compliment by stating that ‘it steams on a candle’, high praise indeed. Alice will run throughout the 2019 season, after which she will be withdrawn for her 10-year overhaul. The old boiler has plenty of life left and after some minor repairs, will be offered for sale. In the meantime, our engineering team will sort out all the fittings and ancillaries so that when Alice is withdrawn at season’s end, her overhaul will be completed more rapidly, a consequence of inspired forethought and planning. 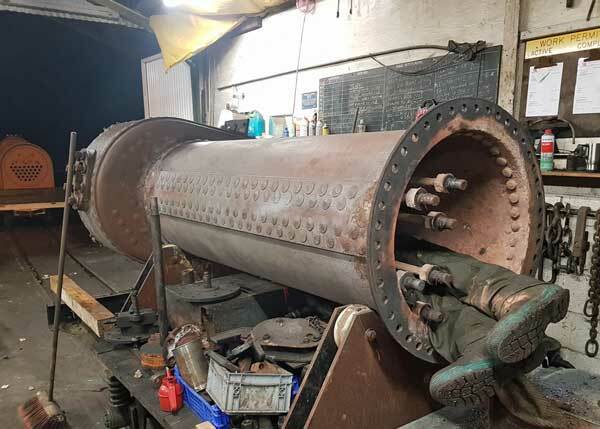 Work continues on Holy War’s boiler which needs repairs and the front tube-plate has been removed, a process which involved drilling out countless rivets (where are the rivet counters when you need them? Ed). Rob has also cut out the affected plate so that it can be used to size a matching replacement. We are now getting close to the stage when we will require external help. The Penrhyn Coach progresses slowly, in spite of winter’s efforts to disrupt David Hale’s best endeavours. The latest news is that 4 more interior panels have been collected by the upholsterer, leaving only 2 left to be done. This wonderful project is really coming together and we hope to show more photos in the near future. 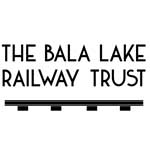 The Bala Lake Railway Trust/Extension Project has always had the wise policy of announcing what has happened rather than what might. There is continued activity behind the scenes but the whole Red Dragon Project is an involved effort, so no news is good news. 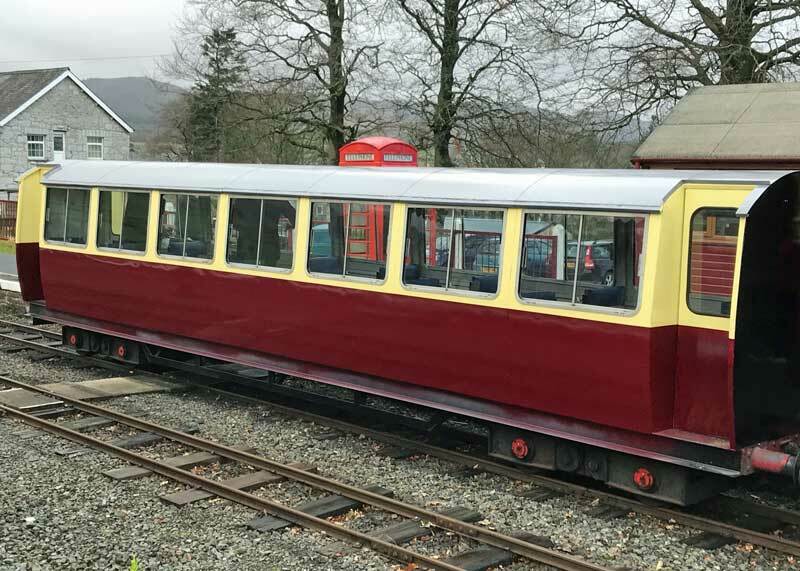 As a side aspect of the Trust’s activities, the first item of modified rolling stock has been completed, and our photo shows a carriage with doors on both sides. As regular readers may have noted, our R&H diesel, Chilmark, has been benefiting from a lot of attention from our engineering team in recent weeks, Rob Houghton and Dan Laidlaw devoting time whenever possible. The ‘stitched’ original block is performing very well, a testament to engineering ingenuity and skill. Recent successes have been the acquisition of new brake blocks as the old ones were distinctly ‘tired’. But one real headache was discovered after Rob and Dan had re-installed her original motor (4.3 litres, 38hp and weighing well over a ton). The replacement motor, fitted a few years ago, was of a slightly different type, on to which Rob had cleverly grafted a production drive for an alternator, that is speeding it up as this type of diesel produces peak revs at a car’s tick-over rpm. But the repaired and now installed original motor has a dynamo, one mounting part of which is an integral part of the block, thus no ingenious adaptations possible – and the dynamo did not work! Noted repairers threw their hands up in horror at the idea but Rob, in his inimitable way, thought it out and, to quote his own laconic words, “I sat down with the heater in the workshop and got busy with a soldering iron.” The result is that, hardly surprisingly, it all now works perfectly and, together with his demon digits doing some fine-tuning of the motor, Chilmark now starts and runs beautifully. As soon as a couple of minor items are addressed, she will be back in service so that our diesel, Bob Davies (aka ‘Trigger’), can receive some TLC. 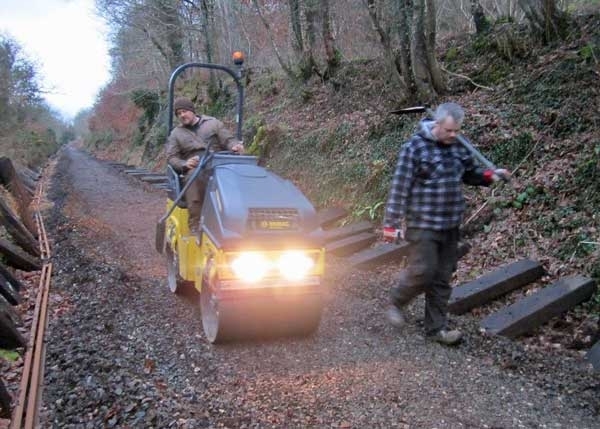 Have you ever toyed with the idea or wondered what it would be like to work on a narrow gauge steam railway, but were not sure how to go about it or how much time you have to commit? Can you see yourself on a loco footplate, in the Guard’s Van or perhaps just helping to keep everything spick and span? 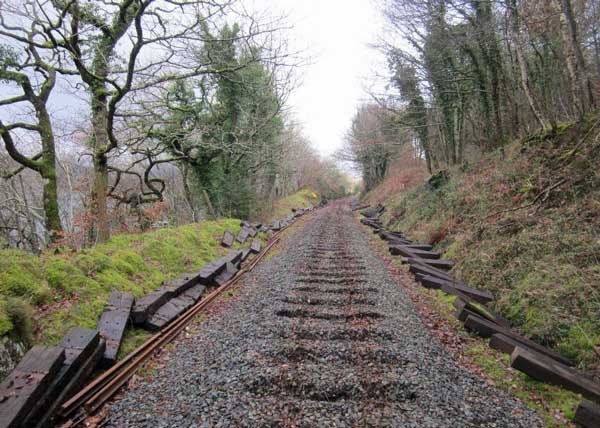 On the Bala Lake Railway, we can make it a reality. Continuing on the great success of previous years, this year’s date is Sunday, 28th April. The day will give you the opportunity to spend time with train crews in their working environment (and have a go yourself under supervision), get the taste of what our maintenance teams get up to outside and in the engine shed, and experience our small, friendly atmosphere which makes the BLR not only special but unique. (Bob’s story on the Working Weekend says it all. Ed). PLUS, there is always plenty of tea! Do have a look. You can never be sure until you have tried. And finally……… by way of slight digression, Rob noticed that after he had been busy on Chilmark’s motor, it now produces a lot less exhaust smoke than before, which brings us to an amusing anecdote. When steam gave way to diesel in quarries, buyers found they had a problem spotting where these new machines actually were whereas, before, steam locomotives were easy to see because of their smoke trails, thus purchasers of diesels frequently asked Ruston & Hornsby to make their diesels produce more smoke so that managers could see what the diesel crews were up to! 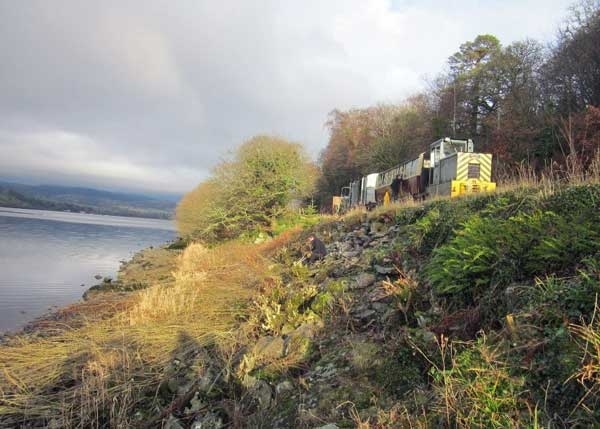 And an Appeal…… we have very kindly been offered, as a donation, a modern diesel locomotive, which in due course will be invaluable to assist on the construction of the extension to Bala. We will be able to reveal more details next month. 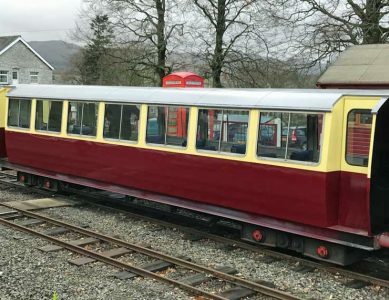 We have also been offered favourable terms to transport it to Llanuwchllyn, but we need to raise just over a £1,000 to cover the cost and we have already received some generous donations. If you can help towards the balance, please read the note below and click here to make a donation. When you donate please state that you are supporting ‘Diesel Transport’ in the ‘Message’ that you send as part of making your donation.